There are some places that the camera loves and where a sense of the sacred hangs in the air. In Georgia, there is one church and one mountain where the cameras have surely clicked more than anywhere else. After Svaneti I head back to Tbilisi and take to the road again to see these special places. My destination is a town officially called Stepantsminda, but still generally known by its previous name Kazbegi. The route lies along the Georgian Military Highway, a two-lane road of uneven quality that goes through spectacular country and finally reaches Russia. The highway goes past the turquoise waters of Zhinvali Reservoir and the exquisite centuries-old fortress complex of Ananuri by the water’s edge. Then it follows the lush green valley of the river Aragvi until it begins an extraordinary climb, with hairpin bends galore and almost sheer drops to the valley floor. North of Gudauri, Georgia’s premier ski resort, the road goes over the Jvari (Cross) Pass at 2,379 metres. Cars and trucks share the highway with the occasional large herd of sheep and goats, accompanied by shepherds, dogs and donkeys. 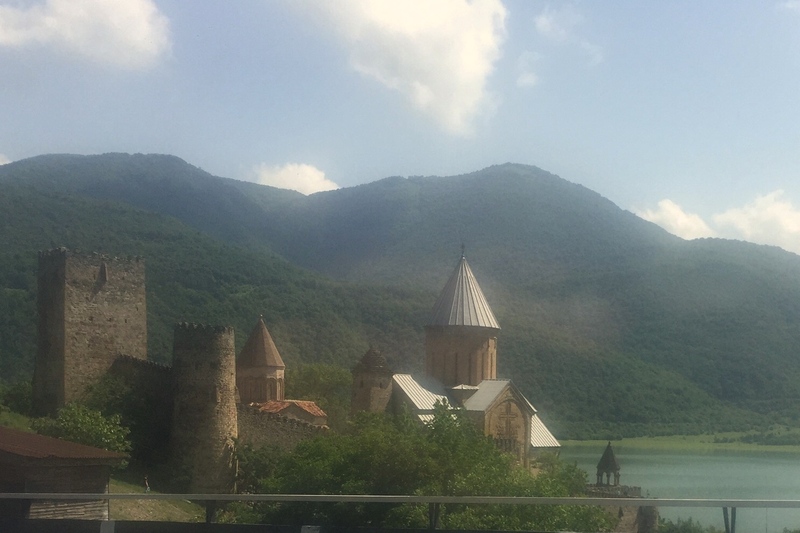 The three-hour ride from Tbilisi to Kazbegi in a marshrutka, or public minibus, costs 10 lari ($4.50) or the price of a latte in a British coffee shop. 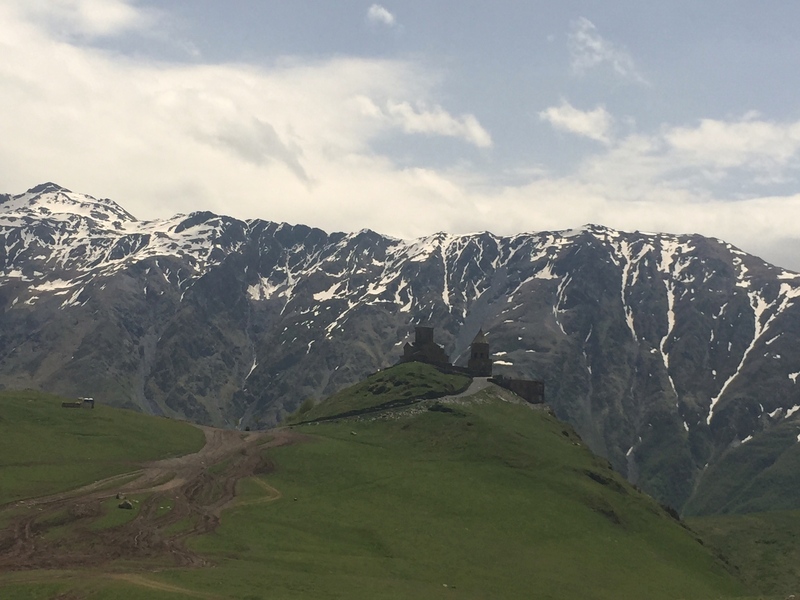 Kazbegi and its surroundings surpass my expectations. To the east is a great wall of peaks, some of which seem in my imagination to have been crafted by a celestial artist out of charcoal and then very lightly sprinkled with snow from a playbox. There is something about the combination of delicate church and massive peak, of yin and yang, which beguiles my senses. It is such a satisfying sight. Once upon a time it was nearly ruined. In 1988 the Soviet authorities completed work on a cable car with a base station in Kazbegi and the top station not far from the church. Local people felt that it violated the sanctity of the place and they destroyed it. British author Peter Nasmyth tells the story of this vandalism in his book Georgia: In the Mountains of Poetry. The abandoned base station is still clearly visible behind the Stepantsminda Historical Museum. 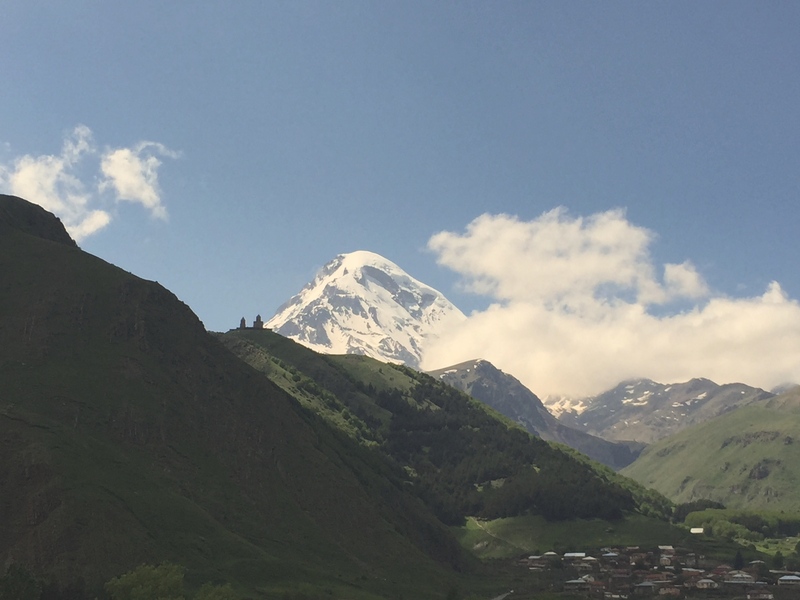 Mount Kazbek’s greatest claim to fame is that, according to Ancient Greek myth, it was on this peak that Zeus chained the Titan Prometheus for stealing fire from the gods. A raven was sent every day to tear out his liver. How many mountains have a back-story to match that one? I hatch a plan to go at least part way up Kazbek and hire waterproof boots from a local mountain guiding agency. A man at the agency says that in seven hours at the most I should reach the Bethlemi mountain hut on the far side of a glacier called Gergeti. I make that my goal and with sleeping bag and food in my rucksack I set out shortly after 10 a.m. in light rain, knowing that the weather forecast is for thunderstorms. But after half an hour the sun comes out and the walk up to the church is a pleasant stroll on a dirt road, first through the village of Gergeti and then through a pine woodland full of birdsong. At the stone church and bell tower on the hill I stop for a while to pay my respects to this triumph of human determination and then push on up a ridge. I reach the first snow and finally, after nearly six hours on the hoof, I stand by the cross on the Arsha Pass, altitude 2,940 metres. 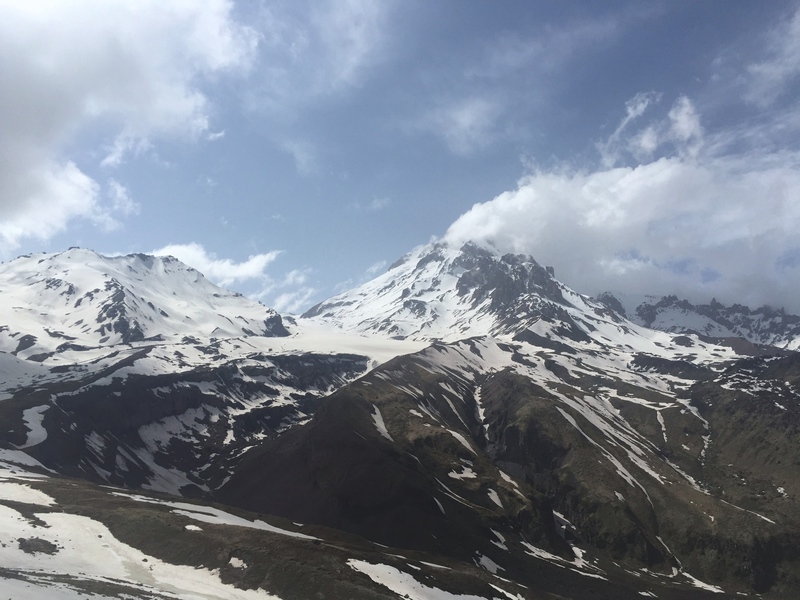 From here there is a grand panoramic view of the Gergeti glacier and Mount Kazbek. This is the limit for day-trippers and now the path gets lonelier, through a wild landscape of rock, snow and ice. I can see why Zeus would have thought this a good place to punish Prometheus. At 6.55 p.m., after cresting a rise in the snow on the glacier, I see the mountain hut for the first time, perched high on a little plateau on the other side. Aesthetically, the Bethlemi hut is not as pleasing as the church, but emotionally it holds out the promise of safety and warmth. I am now at 3,250 metres and have symptoms of altitude sickness – shortage of breath, light-headedness and nausea. This is normal and I go slowly, stopping every few paces to rest. The trodden path across the glacier is easy to follow and there are no dizzying crevasses. This is a plod across a snowfield. After 40 minutes or so I leave the Gergeti glacier behind and begin the final climb to the hut. This is the toughest part of the whole walk, a steep scramble over rocks and snow with no discernible path. My energy is fading, as is the light. Finally at 8.20 in the evening, after more than 10 hours’ walking, I reach the hut, which at first sight seems empty. It is a big place, built to accommodate 200 people. But at the far end of the hut there is a small knot of men outside and an open door. I am led into a cluttered Dickensian kitchen. In the best traditions of Georgian hospitality a mug of piping hot tea is placed before me within minutes of my arrival. Bliss beyond compare! I savour every last mouthful and ask for more. I chat to a Muscovite and to another Russian man from the Siberian city of Krasnoyarsk. My mental faculties are not at their sharpest. What I understand is that they are part of a six-person team, which includes a New Zealander, and they’re set on climbing Mount Kazbek, which is smack on the border with Russia. To bed, exhausted. In the morning there is great excitement. We hear the clatter of a helicopter and rush out to discover what’s happening. It turns out to be the changing of the guard at the Bethlemi hut. The outgoing team has clambered into the helicopter, which has landed close by, and out come two men with new energy and sackfuls of provisions, including fresh Georgian bread. They have arrived for a 10-day shift. The helicopter stays only a couple of minutes, takes off, turns, flies low over the glacier and heads for home. The walk back to Kazbegi is uneventful. The next day I go into a restaurant and there is the man from Krasnoyarsk sitting with a fellow climber. They call me over and we chat. I discover that that in my addled state two days earlier I had misunderstood them. When we met they were actually on their way down after scaling Mount Kazbek. Ahh! So, how was it? “Oozhasno,” says the man from Krasnoyarsk and I can’t help reflecting on what a perfect word the Russians have for “terrible”. He describes walking in the bitter cold, in snow that was up to his thighs. After a few moments he takes his leave and walks towards the door with a very pronounced limp.